one of the largest and most prestigious events in this field worldwide. Held in Gothenburg, Sweden 17-21 September 2017. ECOC is the leading forum in Europe for keeping up with the top research advances and scientific discoveries in the field of optical communications and related photonic technologies. 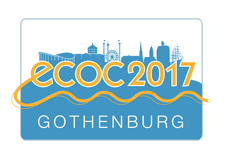 Have a look at the PDF´s, videos and pictures from ECOC 2017. Next ECOC will be hosted in Roma, Italy 23-27 September 2018. In collaboration with major research centres and institutes worldwide, a special pre-ECOC symposium will be hosted at the Technical University of Denmark. The Symposium will address major ECOC-related research efforts worldwide, including large EU-overseas research strategies, large national research investments in research centres and institutes, as well as advanced spatial multiplexing technologies for extremely high capacity data transmission. A major exhibition will be run in parallel to ECOC 2017, covering a wide range of products and services in the field of optical communication. Companies from all over the world will exhibit their latest technologies at ECOC 2017, from materials and devices to systems and networks. Expect to meet analysts, media, government bodies, vendors and users – as well as established colleagues and customers. The exhibition hosts around 5,000 people. Gothenburg is a world leader within sustainable meetings and the greenest hotel city in the world. ECOC conference 2017 is environmentally certified according to the Swedish Environmental Base Standard. The general info section gives you useful guidance over things to know about when planning your visit to ECOC 2017 in Gothenburg, Sweden. The Swedish Exhibition & Congress Centre is the venue choosen for ECOC 2017, located right in the very city center with close proximity to virtually everything!